Text message is one of the most commonly used features on all cellphones and it can’t avoid data loss issue. In this article, I will show you how to perform Samsung phone data recovery and get back deleted text messages step by step. After reading this guide, you’ll be able to recover any deleted or lost data from Android phones. It’s easy to realize this if you have a piece of powerful Android data recovery software which can scan your phone or SD card easily and completely to find our deleted messaged, phones, music, apps, videos, etc. Then you can copy and save recovered data to your computer. To make sure that you can recover files as many as possible, you should protect lost data from being overwritten. For example, please stop using your phone after losing or accidently deleted data. Do not take pictures or install new applications, now connect to the Internet. If you haven’t had data backed up, you need to recover data using Samsung phone data recovery software. It can help you make a full and deep scanning of your phone to find out lost files within a short period of time. The following part represents step-by-step guide to restore deleted files from Android phones. 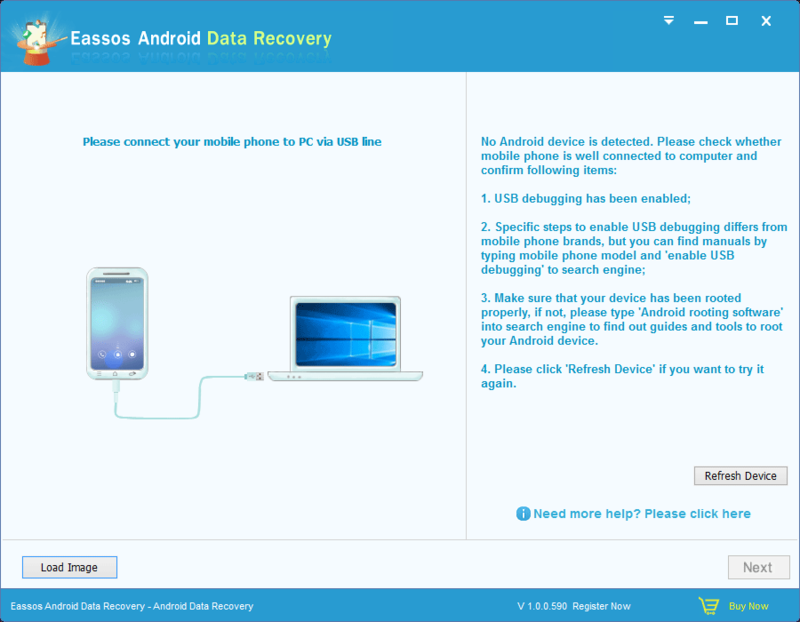 Download and install Eassos Android Data Recovery software on your computer. Then connect the phone to computer through USB cable which should be in good quality. The software will try to identify and load the phone. No software has permission to scan Android phones before the phone is rooted. First you need to enable USB debugging mode for the phone and then get root privilege using rooting software. All recovery software requires super-user authorization before starting deep scanning. Before scanning, you need to select which storage device you want to recover, i.e. internal storage or memory card. You need to choose the one that once contained deleted data. Then click “Next” button to trigger scanning process. After scanning, you can preview files to check file quality. Double click files and you can open it to view file content, and files like pictures, text, document, video and audio are supported to preview. Select files you want to recover and click “Recover” button to get them recovered. This entry was posted in Android data recovery and tagged recover deleted text message, Samsung phone data recovery by EASSOS. Bookmark the permalink.